Looking to dress up your usual avocado salad? Try adding sun dried tomatoes. Why should you? Because a whole cup of sun dried tomatoes is just 139 calories, 7 grams of fiber, and 8 grams of protein. 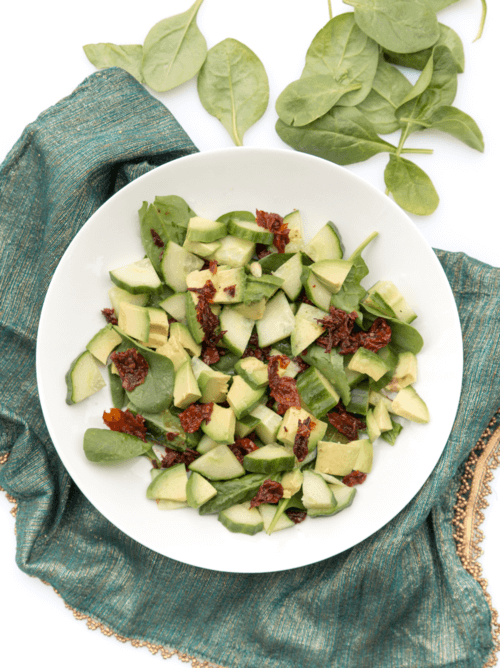 This avocado spinach salad will fill you up, and keep your bones healthy, your heart pumping, and your over all health in shape. Sun dried tomatoes are also a great source of antioxidants, a good amount of vitamin C ( 23%) and sixteen percent of vitamin A, which is essential for vision. Cut up 1/2 cup sun dried tomatoes. Toss with 1/2 chopped avocado, chopped 1/4 cucumber, and 1/2 cup baby spinach. Drizzle ingredients with 1 teaspoon extra-virgin olive oil, 1/2 teaspoon lemon juice, and a pinch of salt.